The day after figuring out how to call Canada I went to see about getting a Carte de Sejour/student visa. I figured it would take one trip to settle that. Back in Toronto the French Consulate had told me that I needed a Carte de Sejour if I was going to stay in France more than 3 months. As a student, I would be eligible. Just make sure to report to a police station within eight days of arriving in France, they told me. There was a police station near my hotel, so I checked in, bringing with me everything that I had been told was required. This meant black and white photos of myself, medical travel insurance, papers indicating that I was a student, an up-to-date birth certificate, my passport, and a statement from my bank in Canada indicating how much money I had. I told the friendly folks at the police station what I wanted. One man who spoke English told me that I couldn’t take care of it there; I had to go to a special location that dealt with that sort of thing. He gave me a map of Aix and circled the area where this special station was. He suggested that it was within walking distance. Slightly dismayed that I couldn’t take care of the Carte de Sejour right away, I left, resolving to take care of it later that week. I also went to the bank to deposit my bank draft of over eight thousand dollars Canadian and to open up a new account. I walked the length of the Cours Mirabeau to check out all the banks. One called Credit Lyonnais looked the most inviting. I didn’t know at that time that this was in fact France’s largest bank, and also that it was in financial trouble as a result of Bruce McNall’s questionable financial wheelings and dealings involving his sports team, the Kings and the Ticats, and his various other activities. This never affected me in any way; I just found it interesting after I got back from France. When I got to the bank around noon they were just closing the doors. A security guard shut it all up solid. This was my first encounter with France’s odd habit of closing stores and banks at strange, inconvenient times of the day. I went away for a bit, then came back and found it open after one pm. I went inside and stood in line only to be told when I reached the teller that, as a foreign student looking to open an account, I needed to talk to someone in a completely different area. They showed me where and I waited some more. I was wearing my CBC radio jacket which has a big old CBC logo on the back, and which said on the top, “Radio Canada.” So when I was wearing that coat I was easily identifiable as a Canadian. It was a major reason why I had bought it along. I turned to find four young women directly behind me. The woman who had spoken was Holly, I learned, from London, Ontario. The three others were Americans, all from California, although one had been born in Lebanon. They were all very friendly and it turned out that they were all going to the same school as me (Institut d’études françaises pour étudiants étrangers). They offered to show me where it was. This had been a concern of mine, finding the damned place. They set my mind at ease in other ways, too, such as exactly when classes started, and how the school helped people find places to live. I opened a bank account with the aid of a friendly employee who spoke English quite well. She assured me the bank draft I had was perfect and that it should go through within a week. That was a Monday and in fact it did go through on the Friday, which was much quicker than the Royal Bank in Canada had told me it would. They had pretty much been guessing. I later wrote the Royal Bank asking for help with some other financial matters and while I was at it thanked them for helping me with my France arrangements. An employee named Lee Bakitch wrote me back, impressed that I had taken the time to handwrite a letter of thanks. I waited as my fellow students finished their banking arrangements, then took them up on their offer to show me where the school was. It had only been a couple of days since I’d had a lengthy chat with someone in English, yet it still felt good to be able to speak English with fellow native speakers. We set out for the school, walking north (for the most part) from the Cours Mirabeau on a series of narrow streets, all bordered by tiny shops selling the latest in fashionable clothes, or electronic goods, barbershops, hair salons, wine stores, boulangeries, patisseries, book stores, you name it, they were there, all crammed next to one another. Tiny cars shared these little streets with the pedestrians, and dogs and bikes and motorized bikes and scooters and full fledged motorcycles. The dogs, hordes of them running loose, left behind a notable legacy—the streets were filled with “crotte de chien.” You had to watch where you were going constantly. I was told that the French considered it good luck if you accidentally stepped in crotte de chien. One way to rationalize it. Every day the streets were hosed down, as near as I could figure mainly to wash this stuff away. I couldn’t imagine the carnage if it were left to accumulate. Whenever a car passed we all had to get out of the street and walk single file along the side of the road. Some streets were off limits to automobiles during certain times; there were thick black iron poles, about three feet high, which would rise from the road to block their passage. A Canadian friend by the name of Doug told me how he figured out that the poles went up and down. One day he noticed that one pole had a neat little pile of “crotte de chien” atop it. He wondered how the heck the dog had got it there. Must have been some neat manoeuvring involved with that, he had thought, before making the connection that, oh yeah, the poles must go down from time to time to let the cars through, and that’s when the dog must have done its business! Unless there had been a particularly acrobat dog about that day. There was a distinctive arch on Rue Gaston de Saporta. Holly suggested that I use it as a landmark. Sure enough, moments after spotting the arch we came upon the school. Which turned out to be somewhat different than I had expected. I had envisioned a campus with lots of grass and many noble ancient buildings and students leaning up against trees. L’Institute Pour Les Etudiants Etrangers turned out to be mainly one old concrete building, although it shared classrooms with the building next door, which was largely for actual French students studying economics and business. You entered our building through a big arch with huge wooden doors. Beyond the arch you passed through a door and then took a right to climb stairs to classrooms and offices on the second and third floors. Left inside the arch you found more offices. Straight through the arch to the other side you entered a quadrangle, where there actually was some sparse grass and maybe a single tree. From the quad you could access more classrooms, including a couple of sound laboratories and an auditorium. To my delight I later found a piano in the auditorium. With the girls I hung the right and climbed the stairs to the second story. Here you could inquire about registration and housing. On that day I just checked the place out. I had lucked out, meeting people who were able to show me where it was. I would be lucky like this in many ways in the days to come. I hung out with the girls a bit more that beautiful sunny day, exploring a bit of the inner city. My main memory is discussing with one girl the fact that she was from Lebanon. I never spoke to her again that year. Of the other girls, I did speak with Holly several more times that year. I had the impression that she was not particularly happy to be there in France. I suspected she was lonely. It would have been easy to be. I was lonely a lot, despite being fortunate enough to make many excellent friends. After I parted ways with the girls, I stopped at a hotel that appeared slightly more upscale than the one I was staying at. I was curious what their rates were. Turned out it was only thirty or forty more francs than the Hotel Vendome, and much nicer. This was the Hotel de la Renaissance. It just occurs to me just now, writing this, how significant that was. Renaissance. To be born again. I don’t mean in the religious sense. I often felt, as the year progressed, that I was living my life over again, in a way. Anyway, Stacey came with us that night. She was very into New Age stuff and brought her Runes with her. She wanted to read my Runes. They’re little wooden blocks like Scrabble letters, only with esoteric designs on them instead of letters. You put them all into a little pouch and then pull them out, one by one, and someone like Stacey reads them for you. So this is what she did. I pulled out the death rune. As I mentioned, I don’t really believe in this sort of thing. Still, I was a bit alarmed. Did this mean I would be hit by a bus in France, or my plane would crash? Stacey was quick to reassure me: Joe, it just represents change, as opposed to actual death. That certainly fit. My life was about to change big-time with France. That summer, the summer before France, I lived alone in an apartment on the York University campus where another curious thing happened. I was coming home from work on a Sunday, and had just rounded the corner of the building where I was living, when I heard a big “splat!” It sounded like a bag of wet concrete slapping the ground from a great height. I rushed back around the corner where I saw a black object flailing wildly. It was disturbing. I didn’t know what it was so I went closer and saw that it was a young black cat, less than a year old. Obviously it had fallen from an open window high up. It was in the throes of a tremendous spasm that lasted several minutes. It broke my heart. A young woman happened along just after me. If I’d had the heart I might have found some way to put the cat out of its misery. I suspected it was quite busted up inside. Finally, it stopped spasming and just lay there, breathing heavily, rapidly. The young woman implored me to call a veterinarian, so I agreed to go inside and call a cab and try to find a veterinarian. Inside my apartment I scanned the yellow pages trying to find a veterinarian open on a Sunday. It took me forever to find one. I called a cab and went back outside. The girl and the cat had disappeared. I didn’t really blame the girl; despite trying to hurry, I had taken a long time. The cab came; I gave him five bucks and sent him away. But I wanted to find out what happened to the girl and the cat, so I went back upstairs and made a sign asking her to call me. When I went to paste the sign to the front door of the building, I noticed another sign from the same young woman asking the owner of the black cat to call her. I took down the number and called her. I apologized for having taken so long. She said that it was all right. The cat had died shortly after I left. She thanked me for trying. All right, I admit it. I’m a bit superstitious. I wondered what it meant, a black cat falling from out of the sky practically right in front of me and dying. That and the death rune some months earlier. I related everything to France at this point. To spell it out, shortly after arriving in France, I began to feel very much like I was starting life over again there. I had gotten rid of many of my possessions before leaving. I had reduced my belongings to the essential me. I drew the death rune. I witnessed the death of a black cat. I went to France where I was unable to speak. I knew no one. I was like a newborn child. I stayed at the “re-birth” hotel. As the year progressed, I gradually grew up again. I learned to speak again. I know this all sounds foolish. But it was always at the back of my mind during my time in France. Anyway, I moved to the Hotel de la Renaissance, going from a one star hotel to a two star hotel. Returning to the Hotel Vendome to get my bags, I felt guilty when I told the swarthy manager that I would be leaving, it being already late in the day, but he didn’t seem to care. No problem. Soon I found myself on the top floor of the Hotel de la Renaissance with a view of Cours Sextius. The room was small but pleasant. It had a charming ceiling, with timber laid in like you might expect to find in a log cabin. It had normal pillows and normal washroom facilities, with one exception: there were no curtains on the shower, which again was one of those hand held jobbies. I couldn’t believe the lack of shower curtains. Was this normal? The entire room might end up soaked. The following morning I used the shower anyway, taking as much care as I could not to wet the room. In the morning the room reeked of sunshine. It crept through the cracks in the shutters covering the window. I guess they weren’t really shutters, as they were on the inside of the window. I threw them open, looked out on a glorious day, and from directly below on the steps outside the caretaker arched his head to regard me. He smiled, like someone only just barely happy, and nodded. I took a shower and realized that I wasn’t crazy about French showers. You couldn’t hang the shower attachment on the wall and just stand under it, revelling in it. You had to hold it in one hand and direct the spray across your body. It was too much work for what was supposed to be, in my experience, one of the more sublime pleasures of being human. Not everyone had showers like this in France, I would learn, but every shower I had occasion to use was this way. For the first three months of my stay, every time I emerged from the shower I realized that my right arm was still completely dry. I now had a number of things I had to accomplish. Finances, finding a permanent place to live, even finding the school. On a less immediate but no less important note, I had to figure out how to use the phones. And I needed to find a laundromat. I hadn’t come across any the day before. Serendipity stepped in on the telephone problem. Shortly before I’d left for France a bunch of friends had taken me out for beers at the Wheat Sheaf Tavern in Toronto. That night my friend Claire De Visme presented me with “A Survival Kit for a Canadian in France.” Transplanted from Lyons, Claire had a pretty good idea what I might find helpful. Aside from the Berlitz phrase book I mentioned earlier, she’d included a Berlitz Country Guide, a wine tasting guide, a corkscrew, a cheese tasting guide, a paint brush, a few French Francs, and a Paris Metro guide. It was a thoughtful and, as it turned out, extremely helpful gift. I was thumbing through the Berlitz phrase book when I noticed a section on telephones in France. I learned that the phones required something called “Telecartes.” You could buy them at the post office or in what they called les “tabacs”, which were basically little pubs that also sold cigarettes and other related goods. The Telecartes gave you either 50 or 100 local call credits, or you could get the operator for free, to place a collect call or use a calling card. There was a post office located near La Rotunde, by La Grande Fontaine, where I had walked the day before. It was a large post office with many serving windows, but the place was jam packed, with lengthy queues of resigned-looking people snaking back from each window. Signs above each window described the function of each attendant. Naturally I was unable to determine the purpose of any, so I just joined the friendliest looking line. I spent half an hour listening to the people around me speak French. I understood nothing. Off to my right a young couple struggled to wrap a large travel bag. They had a hell of a time with it but treated the experience as an adventure. They wore jeans and carried knapsacks and looked like they didn’t have a proper home to get cleaned up in; they looked like kindred spirits to me. On my left an old French guy frustrated everybody in line behind him by arguing loudly with his attendant. She didn’t look impressed. He didn’t appear all that angry. In fact, waving his arms every which way, he looked like he was enjoying himself. Finally he smiled broadly, turned away, and said something directly to me but I didn’t have a clue what. I shrugged and smiled, which may have involved wide, frightened eyes. He lost a bit of steam at that, but recovered quickly, and with one final pointed gesticulation at the attendant, shambled off in the other direction. I’d pronounced the word “tell a cart.” He pronounced it: tay lay cahrte, with the “h” I put in the last word there representing something very strange going on with the “R” in the word. He rattled off a bunch of French that might as well have been Martian. I gave him my best “I don’t know what the hell you’re saying” smile, so he showed me two different cards, one with 50 marked on it in big white letters and another with 100 marked on it. I bought the first one, stuck it in my wallet, said “Merci” in my flat North American accent, and left. I’d accomplished something. I was well on my way to overcoming the telephone obstacle. I felt empowered. Sometimes the thought of all I had to do overwhelmed me and I wondered how I would accomplish it all. But when I managed to get one little thing figured out, I began to feel that hey, I’m no fool, I can do this travelling thing. I’ll get settled in here after all. I couldn’t wait until the first two weeks were over. I figured by then pretty much everything would be settled. I pictured sitting in my first class, starting to enjoy the experience, with the money all taken care of, a place to live, and maybe even a laundromat located before all my clothes began to stink and I became a social outcast. I strolled down the Cours Mirabeau. I saw a few phones but they were all in use. About three quarters of the way down the Cours I decided to venture more into the heart of the old city. The way the city is laid out is you’ve got the cool old city with its narrow streets and three hundred year old buildings and mossy fountains dead smack in the middle of Aix with modern twentieth century suburbs of apartment building and hi-rises sprawling out from there in every direction. 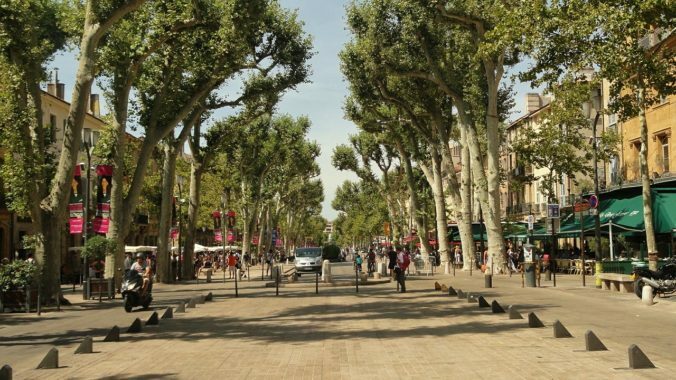 Actually, Aix is mostly these personality-less suburbs. Except that it wasn’t for me because the entire time I was there I spent almost one hundred percent of my time in the old city. The old city really served as the downtown for Aix. For the most part, everybody parked their cars outside the old city and then walked everywhere within. For some reason I had no fear of getting lost, although I’d heard that French cities were not exactly well laid out. This was certainly true for Aix. You would think that one street would connect with another but then it wouldn’t, and if you weren’t careful you could wind up a fair distance from where you actually wanted to go. I ventured down a little side street off the Mirabeau. Whereas the Cours Mirabeau was quite wide, the streets off it were often little more than alleyways. Yet they were bonafide streets, jam packed with tiny shops and sometimes big shops of all varieties. Apartments, too. And lots and lots of dog poop, I would soon learn. After walking a ways I came to a little cross-section of streets in the midst of which were two payphones. Both were in use by a couple of girls a little younger than me. I decided to wait until they were free. There was an interesting looking store nearby called “Kennedy’s General Store.” I thought this was quite odd in the south of France. One of the phones became free. I went in and inserted my Telecarte. I picked up the phone and dialed zero. Nothing happened. I just wanted an operator. At least I had a dial tone. When zero didn’t work, I tried nine. It didn’t work either. I tried several other numbers. Nothing worked. I tried to read the instructions written on the inside of the booth, but naturally everything was French and not at all clear to me. I thought, what the heck, I’ll go into Kennedy’s General Store and ask them how to use the damn phones. With a name like Kennedy’s General Store I figured they had to speak English! Kennedy’s General Store turned out to be a little grocery mart filled with specialty items from Great Britain. It was a little treasure trove, selling North American looking goods unavailable anywhere else. A tad pricy, though. The cashier was a slim woman around forty years old with short, light-coloured hair. She was just wrapping up with a customer in French. Afterward, I approached her and asked if she spoke English. She replied in a British accent that yes, she did. We chatted briefly about what I was doing there in France (going to school to study French) and then I asked her outright: how the heck did the phones work here? She told me that to get the operator you had to dial something ridiculous like nineteen, and that there were other special numbers you had to dial to get the international operator of the specific country you wanted. She had no idea what those numbers were. I thanked her, told her I’d see her around, and returned to the phone. I dialled the correct number to get the operator and got one who didn’t speak English. After gibbering with her for a minute, and mentioning Canada, she transferred me to someone else, who also didn’t speak English. Eventually the second operator transferred me to someone who did speak English, who transferred me to the correct international operator for Canada, who spoke perfect English. It was a beautiful sound. She explained exactly what I had to do in the future to get Canada. It was a six digit number! Then I had her place a call to home, using my mother’s calling card number. I spoke to Mom for about fifteen minutes. I told her to call my girlfriend Lynda and apologize to her for not having called earlier, and to tell her that I would call Lynda that night. I filled Mom in on the trip so far and it was great to talk to her. I felt good talking to her, relaxed. I assured herthat the whole experience was the big adventure it was supposed to be. It felt cool to be calling home from so far away. After hanging up I thanked the woman in Kennedy’s and told her that everything had worked. 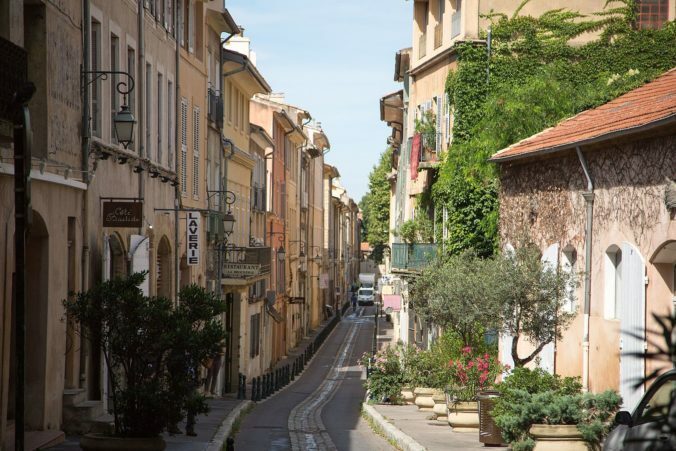 Then I continued wandering the streets of Aix. Cabs pulled up outside the Aix-en-Provence train station about once every ten minutes. I nobly let an older lady grab one before me while I checked out my Berlitz book of French phrases. It had been a gift from a friend at the CBC, Claire de Visme, who hailed from Lyons. She knew what it was like to be suddenly immersed in a foreign culture where you aren’t comfortable with the language. Although it’s my understanding that her English had been much better when she first arrived in Canada than my French was now. And that’s what I said to the cabby who picked me up. He didn’t have a problem with this, and before I knew it we were whipping through a crowded, festive looking Aix. He drove me through what I later learned was the Rotunde, around la Grande Fontaine, and down a wide, busy street to my cheap hotel. Hordes of people clogged the streets, strolling, relaxing in sidewalk cafes, everyone in shades and shorts. I wondered briefly (as I always do in a cab in a strange place) whether the driver was taking me for a ride. Obviously, I was a foreigner. But because I’m generally an optimist and believe that most people are good, I decided that, nah, he was probably honest. I still winced at the end of the ride when it came to about forty francs. I was watching every franc I had until my bank draft came through. We pulled up beside a one star hotel. “C’est bon marche,” the driver told me. 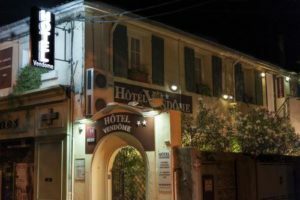 It was a dubious looking affair called Hotel Vendome, located above a pharmacy. You had to pass through a decorative arch and climb a set of stairs on the outside of the building to reach the hotel door. I paid the driver and thanked him, then wrestled my luggage through the arch to the stairs. I got my stuff up in two trips, pausing briefly in between to pat the head of a black cat that was resting on the landing. Afterward I tried the hotel door. It was locked. There was a note affixed to the door in French. I took a moment to decipher it. It said “ouvert a 1600.” My French was pretty poor at this point but this was fairly obvious. It was currently three thirty, so I sat on the steps to wait until someone showed up. The cat did its best to make me feel welcome. A heavyset man about forty years old showed up right on time at four. His looks, I would learn later, were typically Provencal—dark and swarthy. He nodded at me and I at him. He parlayed anglais assez bien. My fears around finding accommodation in Aix proved groundless (for me, at least). He had plenty of rooms free. He led me inside and around a corner. My room turned out to be quite spacious with a large bed and a huge window. It also included a shower, a bidet, and a sink and mirror. It had everything, was reasonably clean, but somehow still felt rather seedy. I may have decided that because it was a one star hotel it had to be seedy. Or maybe it was the threadbare sheets and the dark and dusty hallways. If I’d had my druthers I’d have preferred to stay someplace else. But just then I was grateful that I didn’t have to spend the night outside on the street. Not only that but I’d managed to find the place quite effortlessly. Here’s the embarrassing part. Checking out the room, I must confess that I was confused by the bidet. I realize that this is the classic (unsophisticated) North American’s mistake. Also I have no excuse having seen Crocodile Dundee 2 in which the eponymous Australian confronts a bidet, so I should bloody well have known what the thing was for. Just the same I didn’t recognize it. I just saw what I thought was a vaguely urinal shaped porcelain object resting on the ground beside the sink. The mystery was solved shortly afterward when I returned to the hall and discovered a door nearly opposite my room. Behind it lay a small chamber wherein lay a comfortable, conventional toilet. Clearly then, my floor model was something else altogether. I was bemused by the key to my room. It was a skeleton key, such a simple affair that I wondered about the security of my room. It seemed to me that the lock would be easy to pick. I took a shower, which felt great. I had no shaving cream so I was stuck with about two day’s growth. But I looked fairly respectable with a black blazer I’d brought along, and it was thusly attired that I first ventured out on my own, in Aix. Although I wasn’t particularly hungry, I hadn’t eaten a good meal for a couple of days and figured I’d better eat something to keep my strength up. As I walked, I kept an eye out for someplace where I could get a healthy dinner. In the cab on the way to the hotel we had passed what looked like the main street of Aix, featuring a prominent fountain, which I recognized from reading about Aix before leaving Canada. 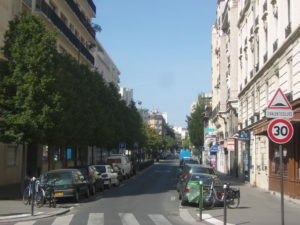 I later learned that this street was the Cours Mirabeau. I judged it to be within walking distance, so I set out to find it. It was late afternoon but still quite warm. It felt good to be walking somewhere while not lugging more baggage than I could carry. In fact I felt pretty good period at this point despite the thousand concerns still on my mind. I noted that there was a large supermarket near my hotel. Walking up my street to what I hoped was the centre of town I observed bars, travel agencies, other hotels, shops with signs such as “Boulangerie” and “Patisserie” (bakery and pastry shops respectively). It turned out I was seven or eight minutes from the Fountain. Hanging a left from the fountain put me on the main street, the Cours Mirabeau, which is famous as one of the most beautiful, breathtaking main streets anywhere in the world. Don’t feel bad; I hadn’t heard of it either. But it is quite something. Bordered on either side by stately plane trees (I didn’t know what they were either—apparently before they were planted along the Cours Mirabeau it was all elm trees, but they died, so the city fathers replaced them with plane trees). Plane trees look similar to Maple trees when they have leaves, but look gnarled and strange when they don’t have leaves, in the winter. The Cours Mirabeau itself is a street bordered on one side by cafes, restaurants, a fast food restaurant called Quik, a record shop, more cafes, a department store called Monoprix, a bank or two, and more restaurants and cafes. On the other side is mostly large, stately bank buildings. At one time many of these buildings had been the homes of the French elite. I walked up and down the length of the Cours Mirabeau three or four times, thrilled to be there. The street was packed with people. Everyone seemed carefree and happy. Menus for the restaurants were placed outside on the sidewalk so you could peruse them before going in. Very few people sat inside the restaurants—almost all of the patrons sat around tables arranged outside, crowded together so that you could barely move amongst them. I examined each menu as I strolled past the restaurants, trying to glean from what might as well have been hieroglyphics to me what exactly was being offered and for how much. Each menu offered a plat du jour (I understood that much). But when I finally settled on one for 55 francs at Les Deux Garcons I had no idea what I was going to get. All the tables outside were full so I went inside where there was plenty of room. A black and white uniformed man with a thick black moustache served me with what I thought was an air of slight disdain. “Le Plat du Jour, s’il vous plait,” I ordered, with what had to be among the worst accents he had ever heard. But he understood me and soon I was eating a dish of lamb, served with a thick, sweet sauce. Although it was delicious, I had absolutely no appetite and had difficulty finishing it. I forced myself to finish it anyway. I drank water with it because I didn’t want to spend too much. I just ordered the water in English because I didn’t know how to in French. The waiter had no trouble understanding me. On my way back to the hotel I checked out a phone booth because I’d been meaning to call my parents and my girlfriend to let them know that I was okay. From outside, the phone booth looked fairly North American. Inside, the phone itself was slightly different. The main difference lay in the fact that it did not take money. I was surprised and dismayed to see this. There was a slot that accommodated a card of some kind. I thought, okay, it takes credit cards, maybe. But I didn’t try it at the time. I was eager to get back to my room to see whether anyone had broken into my room and stolen my stuff. A little paranoid, maybe, but I figured that with the way the locks were it would be easy enough to do. I wasn’t really worried but the possibility crossed my mind, and I was in a bit of a “worst possible case scenario” frame of mind during those first few days. But when I got back everything was cool. All my stuff was untouched. I reclined on the bed and read a book I had brought along: a fantasy, The Shadow Rising by Robert Jordan. It was the fourth in the series, so I was familiar with the characters and the general storyline, and I liked it well enough. It helped me get my mind off my fears, so I was glad I had it. After a while I got up to find a convenience store or somewhere to buy shaving cream to get myself cleaned up. I found a gas station down the street with a little store where I bought some. I shaved back at the hotel, then went out again to try the payphone. I still couldn’t believe it didn’t take change. I just wanted to get a hold of an operator to call my folks and my girlfriend using their calling card numbers, or failing that, collect. But it needed some kind of card. There was a grey display panel on the phone that produced words in black letters when you took the phone off the hook. I didn’t understand any of the words. There were operating instructions on a sign in the booth, again all in French, which I didn’t understand. I went back to my hotel room and read some more Robert Jordan. When I tried to go to sleep, I lay awake some time wondering what the hell I’d gotten myself into. I wasn’t as scared as I’d been the night before in Paris—I wasn’t feeling physically ill anymore—but I was still kind of panicky. Whenever I thought what’s the worst case scenario here, it kept coming up DEATH. I’ll have no money, I’ll have to sleep on the street, I’ll have no food, I’ll simultaneously freeze and starve to death. To make matters worse, the pillow on my bed was strange and uncomfortable. It was hard and round, about half a foot around, and ran the width of the bed. It was not an acceptable pillow. I managed to get to sleep anyway. I finally got up, utterly unable to sleep. I knew I had to eat something. Unfortunately all I really felt like doing was vomiting. Nervousness and lugging too much baggage all over God’s Green Earth had left me weak and nauseous. I got dressed and visited a nearby convenience store. It was now evening and I was wearing my glasses, which I wasn’t accustomed to. That and the dark in a strange locale contributed to my feeling of dislocation. I picked up some fruit juice and an apple. The cashier, a young man, saw that I spoke English and asked me if I was an American. I said no, Canadian, and he perked right up and told about his brother who lived in Canada. He was quite friendly and again I thought how different people seemed to be here than I was led to expect. Back in my room I got the juice and the apple down and tried to sleep again. I gave up and tried to watch some TV. It was all French, of course. There was a movie that looked interesting, a war film, but I couldn’t get into it understanding nothing of the dialogue. I worried about making it to the train station on time in the morning. I worried about catching the right train. I worried about money again. I worried about catching the right train again. I worried about accommodation in Aix. I thought what if this just doesn’t work out at all? What if I have to go back home with my tail between my legs? What would my friends, family and colleagues think? What if I’m robbed? 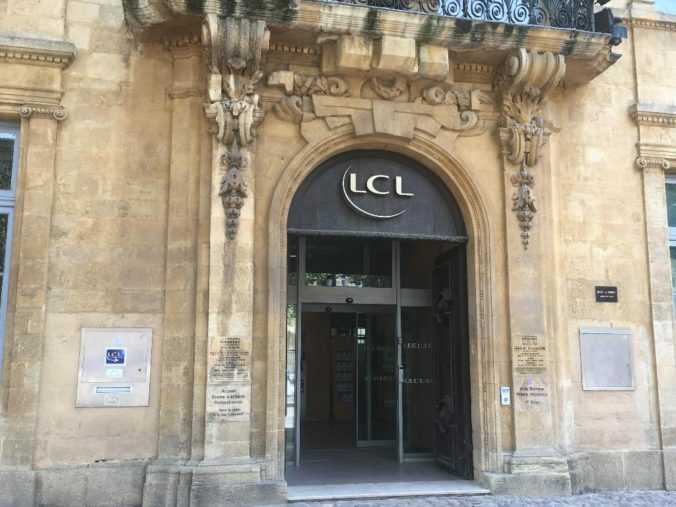 What if the school in Aix doesn’t let me in for some reason? What if I feel this nauseous for the rest of my life? It was the most nervous I’d ever felt in my entire life. One of the most anxious nights I’ve ever passed. Most of my fears proved to be ridiculous but boy they can be hard to control when they’re upon you. I felt marginally better in the morning. I had gotten up quite early to make sure I didn’t miss the train. The front desk clerk was quite friendly, calling me a cab and chatting with me. He didn’t alleviate my fears about Aix, though. He told me to watch out for the people down there, that they were different in the south. Not like Canadians, he smiled. He’d been to Canada and found it so different from France. He’d loved it. Couldn’t wait to go back. Another friendly Parisien. The stories I’d heard must have been about another city named Paris. The cab took me straight (as near as I could tell) to the Gare de Lyon where I was to catch the TGV, those super-fast French trains. It was still dark and there were few people around. I walked inside, happy that my strength had returned a bit, enough to carry my bags. I wasn’t long finding the trains. The Gare de Lyon is a huge, cavernous place. The trains rest side by side like giant sleeping snakes. I was there at five in the morning and they were all lined up waiting for me. I had about a two hour wait to figure out which snake was mine and how to get on it. I didn’t know if my ticket was good as is or whether it required stamping or what have you. I camped out by a set of stairs in good view of the arrivals-departures sign and nervously kept an eye on some rough looking types hanging out not far away. Soon the place began to fill up with folks like me and I began to feel more secure in like company. I saw people stamping tickets in orange posts scattered about, found someone who spoke English and got the scoop on that. Yes, I was supposed to stamp the thing. I did so, glad I’d settled that. Later someone asked me the same thing, a fellow from India, and I felt happy to be able to instruct him. The trains were quite long and I didn’t relish the thought of lugging my bags around trying to find out where I was supposed to be. I still wasn’t feeling all that well. There were carts around similar to the ones they’d had in the airport so I decided to grab one. I didn’t know how much they cost as they weren’t free like at the airport. I saw a woman about to return one so I thought perhaps she wouldn’t mind if I just grabbed hers. I did the “vous parlez anglais?” thing and lo and behold she didn’t. But she understood that I wanted her cart. I asked her how much and she waved a ten franc piece in my face. I dug out a ten franc piece and tried to give it to her but she wouldn’t take it. Instead she insisted on locking the cart back up with the others. We had a little bit of a tug of war, as I hadn’t completely understood how the system operated and feared that if she locked the thing up I’d never get it back again. But my manners soon got the better of me and I let her do it. Then, just as I was thinking, oh darn, there goes that thing, she grabbed the ten franc piece from my hand, inserted it into a little slot on the cart, and unlocked the contraption again. I was mystified why she hadn’t just taken my ten franc piece and let me have the cart to begin with, but I was grateful just the same. I suppose she just thought she’d teach me how the thing worked. (Such carts became common after I returned to Toronto, but this was the first time I’d run across them). Anyway, it was great not to have to lug my luggage around anymore. I found my place on the TGV (which stands for train de grande vitesse, or Train of Great Speed). I was the first one on my car. By the time we left, though, the coach was packed. This bothered me as I had a window seat and I was still feeling nauseous. I could visualize some ugly things happening, worst case scenario speaking. I popped one of the gravol Ron had insisted I buy, kept an eye out for an ever-elusive Eiffel tower, and an hour into the trip managed to get to sleep. I awoke a couple of hours later feeling much better. We were about an hour outside Marseille. I’d probably slept about two hours and the difference in how I felt was incredible. I was able to sit back and enjoy the sights. It was quite picturesque in this area. The landscape was quite rugged, lot of rocks and hills. The forestation was sparse and shrubby. I had my first glimpse of the Mediterranean. I don’t remember being struck by the colour of it at this time, but I saw it again on a trip to Nice and marvelled at its truly remarkable shade of blue. The architecture of the houses was quite a bit different from what I was used to. They used uniquely shaped shingles made from what looked like baked clay in a variety of colours. I later discovered that this rounded type of shingle is unique to Provence. We made it into Marseille around noon. The day reflected my improved mood. It was hot and sunny, just as I had expected the south of France to be (at least, when I wasn’t worrying about being stuck outside all night). I was still nervous, but now my nervousness was focussed: how to catch the train to Aix? It wasn’t as straightforward as I’d hoped it would be. My ticket had specified a time, but when I scanned all the platforms in the Marseille St. Charles station I could find no corresponding trains. I did find one platform with a train leaving about an hour later than the indicated time. I found an information booth and asked the young woman there if she parlayed anglais. Brusque and businesslike, she informed me that, “Non,” she did not. Somehow I conveyed to her what I wanted to know and together we determined what platform my train was supposed to be on. I carted by bags to the platform (on another one of those great carts) and began waiting. I kept a close eye on my bags as I figured I looked like a pretty easy mark. Half a year later a friend from Calgary told me the story of her arrival at the St. Charles station. Suzanne was an experienced traveller, having already spent thirteen months seeing the world from the deepest heart of India to Europe and North America. Nevertheless her mental state upon arriving in Marseille was not unlike mine. Flying from North America to Europe pretty much requires being up most of the night, and if you’re travelling again the next day you’re going to be pretty knackered. Suzanne had been smarter than me, having flown to Nice instead of Paris, so she didn’t have as far to go. Just the same she was still pretty tired when she got to Marseille. Like me, she was feeling nervous about what was going to happen in Aix. As she was waiting for the train, she noticed a seedy looking guy checking her out. She didn’t pay much attention until she went to use the washroom and the guy followed her. He waited just outside and was there when she came out. Scared, she went back inside, waited a bit, and then checked again. He was still there, leering at her. Again Suzanne went back inside the washroom, by this time quite scared and worried. How to handle this? As she put it, she completely forgot that she was already a battle-hardened world traveller. It had been a year since her world travels so perhaps she was a bit out of practice. Unnerved, she shed a few tears, but finally managed to pull herself together. There was a woman washroom attendant present, so Suzanne confronted her with the problem. Fortunately Suzanne already spoke enough French to make herself understood. The attendant was helpful and fetched a gendarme who told the guy to beat it. He disappeared and Suzanne was able to finish her trip uneventfully. Another friend, Tove from Denmark, told me that she found the trip to Aix quite unnerving as well. She worried about everything just like Suzanne and me. One of Tove’s main concerns was “wondering if anyone would like me.” This might sound silly but it was true. You do wonder whether you’ll be able to get along with people. Tove told me that when she got to Aix she went straight to the hotel she’d booked only to find that, just like my hotel in Paris, they were all booked up, despite Tove’s reservation. Frustrated, she insisted that they phone around to find her another place. They did so, but apparently not very willingly. It didn’t do any good. She was informed that every hotel around was booked solid, sorry. Alone, with more bags than she could easily carry (just like me), she became quite concerned about her possible fate. She set out on foot to try to find a place to stay. Luckily, she met some other students outside who offered to help her with her bags. As it turned out the first hotel she tried had plenty of room (suggesting that the previous hotel hadn’t tried very hard). Relieved, Tove stayed there, and the students who had helped her with her bags became her roommates for the first term. Joe: Dishevelled, pasty-faced, too much luggage. He’d seen my Canadian flag on my backpack and asked me if I spoke English. I said yeah and we talked for a bit. He was going to Aix too. He was from California (I’d never have guessed) and was on a two month trip around Europe by himself, though he was going to meet up with a female friend later. I told him my plans and he seemed to think it was an interesting idea, studying French in Aix for the year. We talked about travelling around Europe. I asked him if he made reservations in advance at the places he visited. 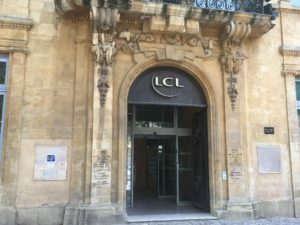 I was still worried about finding a place in Aix and was looking for reassurance. He laughed and said almost never. In all the travelling he’d ever done, he said—and he’d done a lot—he’d only found himself stuck once, in Bangkok. And it hadn’t been that big a deal to spend one night outside. Eventually a train arrived but it turned out not to be the train to Aix, even though I had been informed that it would be, and the sign at the head of the platform said that it was. This prompted some scrambling around as we hastily tried to discover the correct platform. At the far side of the station we discovered the appropriate platform. I boarded the train as the Californian went off to look for a sandwich somewhere, and I didn’t see him again until Aix. It was a forty-five minute trip to Aix. It was beautiful, sunny and warm—a good sign, I decided (as an optimist, I managed to consider both rain and sunshine auspicious). We crossed over hills and trestles that allowed me to look down into Aix as we arrived. All the buildings seemed to be white in the suburbs. I wondered what kind of people lived in them. I wondered whether I would fit in. He replied that he didn’t even know if he would stay the night. He was scanning the big overhead schedule for train times back to Marseille in case he didn’t like Aix. He wished me good luck, and I had the distinct impression that he meant it. He looked at me with a sort of pity, as though regarding a particularly scrawny stray dog, wondering if it would still be alive in a day. It was still dark when we made the coast of Ireland. The captain had said we might be able to make out some of the Emerald Isle but that wasn’t the case. Too dark and too much cloud cover. We carried on and by the shores of France it had begun to lighten up a tad. But still I couldn’t really see anything for the clouds. It wasn’t until we began our descent that I finally caught a glimpse of France. When we came out of the clouds I saw that it was going to be a bleak day. Drizzly. I saw French countryside and scattered farmhouses. I felt nothing save a dull curiousity. What was going to happen? This initial look at France told me little; so far it looked pretty much the same as Canada. We touched down and I exchanged goodbyes with my young French friend. I was kind of curious what would happen with French customs. This was my first flight overseas and I figured there would be a big to-do over passports and what you were bringing into the country and so on. But all that happened was I stood in a line for a while, a young man in a booth cursorily examined each of our passports, stamped it, and we were past customs and free to go. I thought, boy, you must be able to bring anything into this country. I would imagine there were officials on the lookout for suspicious looking characters but maybe not. In any case I had passed muster. I collected my bags. They had carts sitting around that anyone could use so I grabbed one. I thought it was considerate that you didn’t even have to pay for one. I saw my French seatmate greeting his family. I was pretty sure he saw me, and wondered if he might call me over to greet his family, but of course that was silly. What would he say? Hey folks, I’d like you to meet this guy here that I don’t even really know! But I sat beside him for a little while so I thought maybe you should meet him. I chuckled and shook my head at myself and left the arrivals area of the Charles de Gaulle airport. I was nervous about this part of the trip. How to find my way downtown to my hotel. I figured I could take a taxi or an airport limo, but that would cost a fortune. Instead I made my way to an information desk. A friendly looking woman greeted me in French. I asked her if she spoke English and she replied that she did and told me how to get downtown. I thought, well this is good if lots of people speak English (I would change my mind about that later). A shuttle bus took me from de Gaulle to the RER line, which is something like the Go train in Toronto. From there I could connect with the Paris Metro. I took a few minutes there to collect my thoughts and sort out my baggage. I stared for about ten minutes at various maps until I felt there was a possibility I wouldn’t become irrevocably lost. Having simply lugged my baggage with me onto the shuttle bus because it hadn’t been far to walk, I realized now that I had better get my big backpack set to wear. I knelt down and examined my friend Ron’s handiwork from before my departure. It was a veritable work of art. There wasn’t a hint of a loose strap anywhere. All loose ends were neatly knotted and tucked away. It took me about fifteen minutes of cussing and perspiration to get the damn thing completely undone. I bought my ticket for the RER. I said, “One,” holding one finger up. The ticket guy muttered something, I have no idea what, so I just shoved him something like fifty French francs. It sounded like a lot to me and under the pressure of the situation I found myself completely unable to translate French money into Canadian funds to get a frame of reference. I got a ticket and a wad of French francs back so I was happy. I checked my change and it seemed to me the ticket had cost a fair bit. This concerned me a bit because of my financial situation. I had plenty of money on me, in French francs and traveller’s cheques, or so it seemed to me. Nevertheless I had this gnawing fear that for some reason I would run out and wind up stuck. Never mind that I also had access to a credit card with a two thousand dollar Canadian limit. I thought, sure I have the credit card, but what if it doesn’t work here in France? I had a bank draft from the Royal Bank of Canada for the sum of eight thousand, four hundred and twenty six dollars (or something like that), which I was told I simply had to deposit into a bank somewhere. But what if banks refused to accept it in France? And what if the credit card didn’t work? And I ran out of my supply of French francs and travellers cheques? These were my perhaps silly but nevertheless real fears. Toronto time it was now about four in the morning, and I hadn’t managed to sleep much on the plane, so I wasn’t at my absolute best. Casting my nagging concerns aside, I carried on. Despite my fears I was enjoying myself, a bit. A little tense, but pretty sure everything would work out okay. The train station (or RER) was quite busy. I saw a few others with backpacks and wondered who they were and where they were going. I looked for Canadian flags sewn on the backs of the backpacks, a practice almost universal amongst Canadians, it seems, but I didn’t see any. I hefted my backpack with my Canadian flag onto my back and entered the RER. I took up a lot of room in the train but no one seemed to mind. I sat in a seat with a map of the route beside me on the wall and soon was satisfied that I was headed in the right direction. A lot of the route on this train was above ground, so I was constantly looking out the window, taking in my first glimpses of Paris. I kept hoping the Eiffel Tower would turn up, but it didn’t. I managed my connection from the RER to the Metro easily enough. I was lugging a lot of bags but it didn’t seem to be a problem. The weather was still overcast and drizzly but this didn’t bother me. It was warm enough and I actually kind of like rainy days. It dates back to when I was a kid. I liked to read a lot, and while my mother appreciated this, she still liked to see me get outside to play. So often I would be reading, immersed and enjoying myself, when suddenly my well-meaning mother would unceremoniously shove me outside. This never happened on rainy days, so I came to appreciate that sort of weather, and is why I considered it a good sign that my first day in France was rainy. The helpful travel agency guy in Canada had instructed me to get off at Place d’Italie station in downtown Paris. I had been led to believe that my hotel would be located just around the corner. I had a map on which the travel agency guy had drawn a small circle, suggesting that my hotel would be located somewhere within that circle. Emerging from the Place d’Italie station, I surveyed the situation. I was in a busy area. Lots of people about, wide streets replete with noisy automobiles, and tons of large stone buildings hulking over all the goings on. Many of these buildings were hotels, but the one I was looking for was not amongst them. They looked pretty pricey. Mine was located along a side street somewhere, no doubt. I wandered along a bit, enjoying the foreignness of the place. When the drizzle became more of a pelting rain I took shelter under a colourful canopy in front of a small canteen. I stood there a while, keeping dry enough and checking out the people going by. They didn’t look that different from North Americans to me. When the rain slowed up a bit I set out again. It soon became clear that relying on luck to find my hotel was not the answer. I set down my bags and re-examined my map. 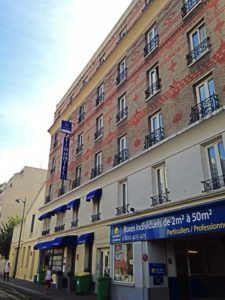 This time I did what I should have done before I even left the airport: I looked for the location of the street the hotel was located on, which was rue Barrault. It was silly not to have done this earlier and I really don’t know why I didn’t. I suppose I’d had a lot of things to think about and I had trusted that the travel agency guy had indicated the correct location of the hotel on my map. Naturally I discovered that rue Barrault was in a completely different quadrant. My friendly neighbourhood travel agency guy wasn’t completely off but I would have been better served getting off at a different Metro stop. So, just to make things even stupider, I decided I could walk there just the same, never mind that my luggage was starting to feel awfully heavy, and it was now six in the morning Joe time. Well, I couldn’t find the damn place. I got to the point where I couldn’t carry all my bags together more than about two hundred feet at a time. A woman saw me poring over the map and stopped to help me. She gave me directions in pretty good English. I was impressed. I had been led to believe that Parisiens were generally rude, especially to Anglophones. Somehow I STILL couldn’t find the hotel. Finally I was just so tired that I did what I should just have done right from the beginning. I flagged a cab. I was pretty happy when I got in the lobby of the place. I was all cheerful to the front desk clerk. I had decided that the best thing to do to ensure that people were friendly to me was to attempt to speak French at first. I had heard that this was appreciated. Then when they heard you abominate their beautiful language, they were more than happy to speak to you in yours. It was pretty much all I knew, although I did have a little Berlitz book of commonly used phrases that I could resort to if required. But that one line was all I really needed. Everyone I encountered in Paris spoke English. In fact, as I was to discover later, the trouble with trying to learn French in France is trying to get the French to stop speaking English to you! Unfortunately the clerk, although she was more than happy to speak English, was less than happy to see me. I was slightly aghast, but figured that so long as there was a room somewhere it was all right. When the clerk got off the phone to the other hotel she gave me her best hangdog look and informed me that unfortunately there were no other rooms available at any other hotels either. Obviously she only meant within her chain of hotels, the Timhotel chain, but I didn’t relish the thought of hitting the pavement again to look elsewhere. Also, since I’d had a reservation, the onus seemed to be on the hotel to accommodate me somehow. Well, it turned out they did have a room available, it was just not the room I had originally reserved. I wanted a big room with a shower. All they had was a tiny closet of a thing with no shower. Glad to have at least some place to lay my head, I somehow summoned up enough energy to bargain for something else I felt I desperately required, a shower. I told the clerk that I didn’t mind about the mix-up, but would it be possible to dip into another room not yet taken for the day just to grab a shower? I would do it quickly and the future guest would never know the difference. At first the clerk resisted but probably my body odour swayed her and soon I was scrubbing merrily away in somebody else’s room. When I returned the key, the clerk handed me a card and informed me that I now had a free night anytime I chose at their fine establishment, if I cared to return after such a mix-up. Happy I’d been allowed to shower, I told them sure, I’d be back, and the clerk seemed happy that all had worked out in the end. I checked into my own room and was somewhat dismayed at the size of it. I remembered some old joke about sticking the key in the door and breaking the window on the other side of the room. But it had a bed and a washroom and that was all I needed. That, and sleep. I was now very tired. I wasn’t hungry at all because my nervousness about this whole venture had returned with a vengeance. I took off my clothes and climbed into the clean but diminutive bed. I couldn’t get to sleep, even tired as I was. I got up to use the washroom time and time again. The more I lay there and thought, the more nervous I became. My fears about money returned. 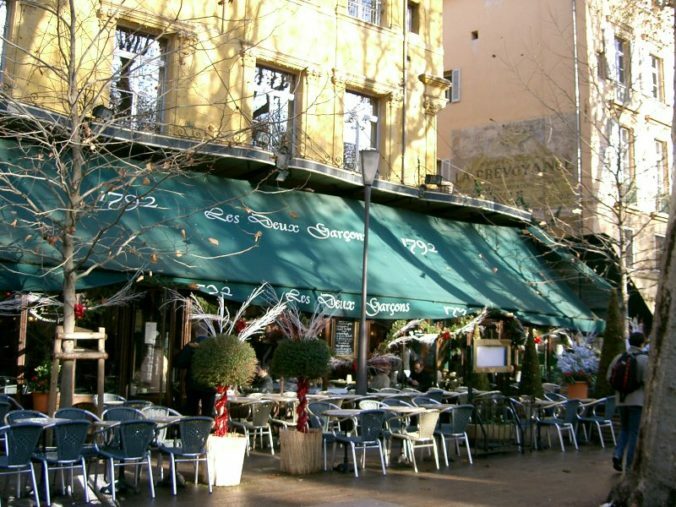 I worried about finding a hotel in Aix, as I had not made a reservation. It was October 2 and I figured it would be pretty cold even in Aix at night, that time of year. Someone had told me that it might be hard to get a hotel in Aix what with school starting in October. I questioned the wisdom of leaving it to chance. I visualized toughing it out on the streets at night, worst case scenario. I had expressed these fears to Joram before leaving, half in jest, and he had simply laughed at me. The bottom line was, I was an inexperienced traveller. I didn’t know what fears were realistic and which weren’t. I hoped that Joram was right and my fears were unjustified.